Renowned coin expert and best-selling author, Jeff Garrett, sat down with us recently to discuss the new second edition of his popular book, 100 Greatest U.S. Modern Coins. During our interview, we couldn't help but also ask Jeff about his most recent headline-grabbing purchase: the famous 1913 Liberty Head Nickel which he bought at auction for over $3.1 million dollars! Q: Jeff, you're well known as the co-author of the best-selling book 100 Greatest U.S. Coins. Many of the coins featured in that previous book date from 1700 and 1800's. Can you tell us why you chose to focus on modern U.S. coins for your new book? A: My book, 100 Greatest United States Coins, has been very popular. The book is now into its third edition. I believe the reason for that popularity is the great stories those coins have to tell. The problem for most collectors however is that the majority of the coins in the 100 Greatest US Coins book today cost tens of thousands (if not millions) of dollars. The current price record for a United States coins is over $10,000,000. That was for a superb 1794 Silver Dollar which sold at auction early this year. For years I have been asked by readers if I could write a book about coins that the average collector could afford. After considerable research I realized that many modern United States coins also have incredible stories to tell. I also wanted to give readers a chance to own something that might appreciate in value. One of my biggest business mistakes ever was not buying some of the coins listed in the 100 Greatest United States Coins. Those coins have soared in value as collectors and investors focus on buying coins with compelling stories. Many now call this trophy hunting for coin collectors! Q: While some of the coins featured in the 100 Greatest U.S. Modern Coins are quite rare and expensive, I was struck by the fact that quite a few are actually within the reach of many collectors today. Can you focus on a few of your favorites that can be owned for $2,000 or less?? A: As I mentioned, most of the coins in the 100 Greatest United States Coins book are very expensive. There are quite a few extremely expensive coins in the 100 Greatest U.S. Modern Coins book as well. There are however, many that are quite affordable for the average collector. Remember it's about the wonderful stories these coins have to tell. One coin that comes to mind is the 1995 Double Die Lincoln Cent. These coins have very strong doubling on the obverse and are similar to the popular and extremely expensive 1955 Double Die Cents. I also have great memories of when these coins were first discovered and the rush by those trying to locate them. A few of the coins are on the list because of their historical importance. The American Silver Eagles series has become one of the most popular and widely collected coins ever made by the United States Mint. The 1986 Silver Eagle was the first of this great series and will always be popular as such. There are also several other low mintage and interesting Silver Eagles on the list of 100 Greatest US Modern Coins. Q: As you travel the country and talk to people about this book, what things do they respond to and get the most excited about? Is it the design of the coins? The story behind why they are rare? The coin's popularity? A: As you can tell I love to tell stories about coins. It's really is the driving force behind coin collecting. No one wants a coin just because it is rare. An 1804 Silver Dollar is worth millions, yet surprisingly there are over a dozen examples known. There are coins that are much rarer than an 1804 Silver Dollar, yet they sell for a fraction of the price. 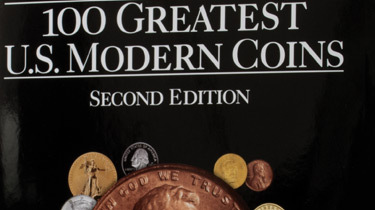 The 100 Greatest US Modern Coins book has opened collector's eyes to the possibility of buying a coin with a great story that has an affordable price. Many want to buy as many as they can find. Q: Jeff, you made headlines recently when you purchased the rare 1913 Liberty Head Nickel for more than $3.1 million dollars. While few of us have coins of that value in our collections, can you talk for a minute about a collector's pride of ownership, and how it feels to hold a true numismatic rarity in your hands? A: My recent purchase of the 1913 Liberty Nickel for over $3 million, brought out the true collector in me. I have been buying and selling coins for over 40 years and in that time I have handled almost every coin in the Redbook. I seldom give a second thought when buying a coin for over $10,000. The 1913 Liberty Nickel was another case. I was a nervous wreck! The 1913 Liberty Nickel is the most famous United States coin. The coin has an incredible story and this particular coin has an even better than story than the rest. When contemplating the purchase of this coin, I was mostly attracted to the idea of becoming a part of its history and making numismatic history. It was a chance for me to elevate my numismatic game to new heights. Bidding on the coin was a surreal experience. The room was filled with collectors, dealers and the media. Everyone was there to see the 1913 Liberty Nickel sell. I had only finalized plans to bid on the coin a few minutes before the coin was offered, and no one in the room considered me to be a potential buyer for the coin. There were two or three rows reserved for VIP bidders and I was seated in the back of the room with my son. The coin opened for two million dollars and about 3 minutes later I was the proud owner of America's greatest coin! The room broke out on applause and I was surrounded by the media. I had not thought about what I was going to say, and I tried to choose my words carefully - the whole word was watching. It was the most exciting episode of my career. It gives me goose bumps just telling the story again. The pride of ownership is an important part of numismatics. Like a new collector who has just bought that important coin missing from their collection, the thrill for me was just the same. The story of the 1913 Liberty Nickel is wonderful, but the final chapter on this coin is yet to be written. My ownership is only temporary, and hopefully its future owners will have as much fun with the coin as I have! About Jeff Garrett - Jeff Garrett is an internationally-recognized numismatist and award-winning coin expert. He is also a best-selling author. Mr. Garrett is also the valuations editor for A Guide Book of United States Coins (widely known as the "Red Book"). Over the course of his career, he has handled nearly every US rarity. Recently, he made headlines by purchasing the famous 1913 Liberty Head Nickel at auction for over $3.1 million dollars. Mr. Garrett is also heavily involved in a research partnership with the Smithsonian Institution, where he regularly studies the vast array of numismatic rarities contained in the Smithsonian's National Numismatic Collection.